These lightweight, handsfree headsets let you listen and talk on the go. These days, we use our phones for music, podcasts, news and phone calls -- but when we want to do it wirelessly and privately, we only have a few options. Headphones can give you great sound, but they're not exactly inconspicuous -- or easy to drop into a small bag. Single-ear headsets are fine for keeping in contact, but don't make listening to your favorite band or a Beethoven symphony a really uplifting experience. If you want something very portable but with good stereo sound, you want a pair of earbuds -- but for any kind of decent sound or a chance at an uninterrupted conversation, you need to avoid the cheap earbuds that are all too common. For this review, I tried out three Bluetooth earbud headsets: the Jabra Halo Smart, the Jaybird Freedom and the Plantronics BackBeat Go 3. What I hoped to find among the three were lightweight, easy-to-carry audio devices that had good sound quality for music, podcasts and phone calls. I used each for about a week indoors and out using a Nexus 6P Android phone. I listened to news broadcasts and a variety of music tracks, and made (and took) several calls with each. I also took a walk, leaving my phone in an upstairs office and taking the headset downstairs and out my front door, to see how far I could go until the Bluetooth signal was lost. It turned out that, although these three phones have many similarities, they also differ in some very significant aspects. 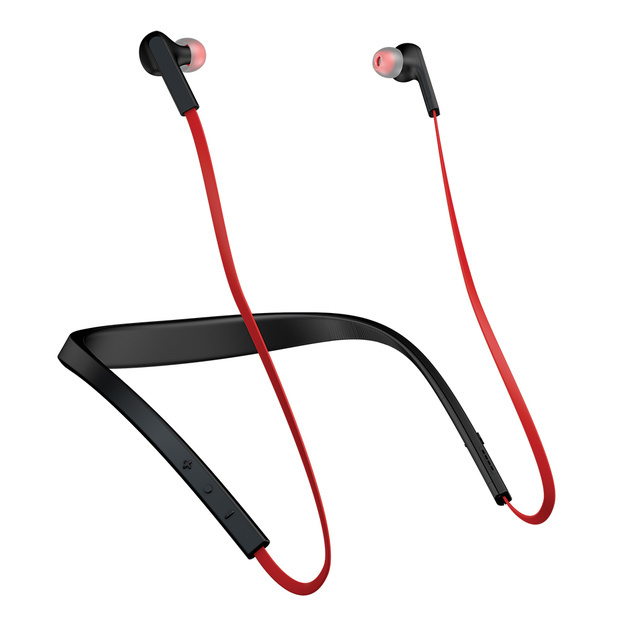 While most stereo earbuds are built for music listening, with phone use as an afterthought, the Jabra Halo Smart, which retails for around $70, feels more like a mobile phone headset that is also good for music. Another interesting design feature, especially if you find dangling ear buds irritating: Each bud contains a magnet that allows you to clip the two together in front of you at chest level. (A nice feature: Attaching them this way pauses your audio or ends a call; if someone calls while they're attached, detaching them will automatically answer the call). You can also attach each bud to the neckpiece itself, one on each side. I thought this an excellent idea, especially for those times I only wanted to use a single earpiece or none at all. It's not a perfect solution -- the magnets will only attach to a small area on each side of the neckpiece and it takes a while to figure out where. But once I got used to it, the scheme worked nicely. The device ships with four sets of silicon tips and I was able to find a comfortable fit. The controls are at either end of the earpiece. On the right side, there are three small buttons: volume up, volume down and (in the center) a multifunction button that will pause or restart your audio, answer and end a call, turn the unit one and off, and start the pairing process. On the left end of the earpiece, a single voice button (which is located just above the microphone) will mute and unmute the mic during a call, and will also activate Siri/Cortana/Google Now (depending on which your phone uses). Finally, the micro-USB port for powering the device is in the back of the neckpiece. One of the advantages of the Halo Smart's design is its battery life. Jabra claims up to 17 hours of continuous listening time (obviously enabled by locating the battery in the neckpiece). While I didn't do any formal time trials, I was able to use the Halo Smart on and off, for music and phone calls, for over three days without having to recharge. When I left my phone in my second-floor office, the music started skipping when I got to the first floor, but I didn't lose the signal until I was at least 30 paces from my front door. Jabra offers apps for iOS and Android. Unfortunately, the Android app is very awkwardly designed. You have to actually download two separate apps -- Jabra Assist and Jabra Service. And Jabra Assist insists on remaining in my phone's memory (and on the notifications bar) whether the headset is active or not, which can be very irritating. On the other hand, the app can activate (or deactivate) a number of very useful features, especially for somebody who wants to track communications. To begin with, you can set the Halo Smart to vibrate when there is an incoming call. And you can have it automatically read out incoming notifications, including text messages, appointments, emails (the sender and subject line only) and texts from Facebook Messenger and WhatsApp. The app also monitors battery status and offers a number of tips on how to use the headset. I found the audio quality to be quite good, especially for something at this price. While music wasn't quite as clean as it was on the Jaybird Freedom, it was certainly good enough to be very enjoyable; you could distinguish most of the details (such as individual choral lines), and both the basses and the highs were present. In phone calls, the Halo Smart performed well. On my end, voices came through clearly and cleanly; the sound was a bit less natural than with the Jaybird, but otherwise fine. On the other end, one caller said my voice sounded quite natural; the other reported that I sounded a bit electronic and that she was experiencing occasional tiny breaks. The Jabra Halo Smart is ideal for people who are constantly on the phone, but want to listen to music or podcasts in between calls. It offers good audio quality for both music and phone calls, a comfortable fit, and battery life that will last through a long workday or an international flight. Jaybird is, if nothing else, serious about audio. The company's Jaybird Freedom is a very lightweight and portable set of Bluetooth earbuds that was obviously designed with audiophiles in mind. It currently retails for $270. Like many of today's Bluetooth stereo headsets, the Jaybird Freedom is made up of a pair of earbuds attached by a thin wire, with an inline module a few inches from the right earbud that holds the microphone and three buttons: volume up, volume down, and a multifunction button that handles on/off, connect/disconnect and other tasks. Be warned: These earbuds come with the widest variety of eartips I've come across so far. You get three pairs of silicone tips, three pairs of foam tips and three pairs of ear fins (that fit in the inner bend of the ear). There are also a couple of clips to help shorten the cable and one more so you can attach it to the back of your collar if you want. An interesting difference about the Freedom is the way it powers up. You don't connect the device itself to a power source; instead, it comes with a "charging clip" -- a small external battery that charges via a micro-USB port and clips directly onto the back of the control module. If you run short of power while listening to music, you can attach the battery to the module and continue listening. You can also charge both the battery and the headset simultaneously by attaching one to the other and plugging it in. Both the buds and the charging clip have LEDs that glow red when charging, and green when fully charged. According to the company, the Freedom offers up to four hours of play and the charging clip provides another four hours. It's an interesting way to handle the problem of keeping a headset powered. While the charging clip adds weight to the buds, it doesn't add so much that they became uncomfortable. When I tested the range of the Freedom by leaving it in my second-floor office, the music continued to play without any skipping until I was downstairs and about 25 paces outside my door. Jaybird's MySound app (available for both iOS and Android) doesn't offer the kind of features that you see in more business-oriented headsets. While it does monitor your remaining battery power and also provides a way to contact support, the real concentration here is on adjusting your audio. I've seen other speaker and headset apps that handle EQ; usually, they offer at most three to five alternatives. The MySound app comes with eight of its own presets, and 11 more contributed by (according to the company) known athletes and other interesting users. Even better: Any of the presets can be tweaked manually by adjusting the low, mid and high ranges. Casual users may not want to bother, but for audiophiles, this app is a must. I was very impressed with the audio, especially from such a lightweight device. It had excellent range from the basses to the highs, and the sound was very clean: I could pick out the individual voices in a chorus or the instruments in an orchestra. It made listening a very enjoyable experience. And of course, if I didn't like the sound, I could easily adjust it via the app. The Freedom also shines when it comes to phone calls. Both callers reported that the sound was very clear and naturalistic; at least one reported that she couldn't tell the difference between that and any high-end headset. Voices were quite clear and crisp on my end as well. The Jaybird Freedom excels in audio quality, both when playing music and taking phone calls. It is extremely portable -- especially with its clip-on battery -- and easy to drop into a bag or pocket. Granted, at $200 it's the most expensive of these three, but if you are a music fan looking for a lightweight stereo Bluetooth headset, this should be at top of your list. 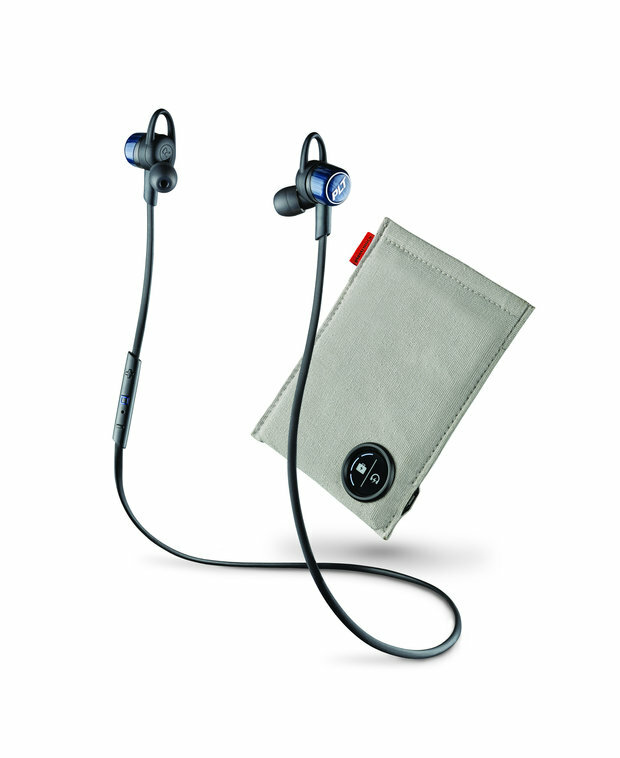 Like the Jaybird Freedom, the BackBeat Go 3, which retails for $119, is built for the active lifestyle. 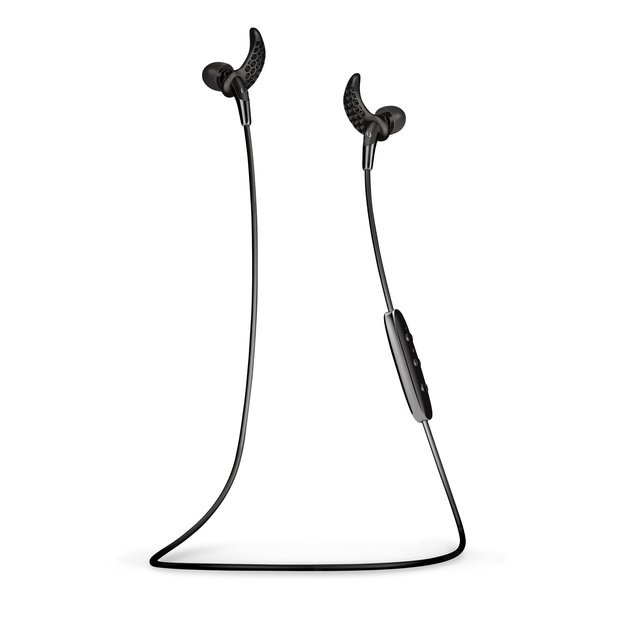 The two Bluetooth headsets even look very similar: Both are made up of two earbuds connected by thin, lightweight cables (although the BackBeat Go is about five inches longer); both have inline controls and both come with their own carry cases. However, that's where the similarity ends. The BackBeat Go 3 comes with three pairs of earbud tips (small, medium and large) and a single loop on each bud that keeps things stable by pushing up against the rim of your ear. I was able to find a reasonably comfortable fit; but it's possible that there are ears that will not fit the loops, and some users may not want them at all -- however, you can't remove them. The inline control consists of three buttons: volume up, volume down, and a center multifunction button that handles on/off and call answer/disconnect. Press down the second button for a couple of seconds to trigger voice control; if you want to mute or unmute the microphone, you press the volume up and down buttons simultaneously. The BackBeat Go 3 held its connection as I took it downstairs and out my door for about 25 paces. The earbuds are powered directly through a micro-USB port that is accessed by pulling the cover off the back of the right-hand earbud. Plantronics claims 6.5 hours of listening time for the earbuds. If you'd like the device to last a bit longer, you can get the optional charge case -- which is worth the additional $30, especially if you do a lot of listening. The case powers through a port in the outside seam; there is a micro-USB cable inside the case to which you can plug the headset; it then powers up while you carry it around. LEDs on the outside of the case let you know the power status of the case and of the headset (when it's connected, of course). According to Plantronics the battery in the case holds an additional 13 hours of listening time. The BackBeat Go 3 Companion app (available for both iOS and Android) adds little to the mix. The app lets you switch the connection to a different device, set the language of the device and switch to wideband audio, which offers high-definition voice quality. Along with a pairing and get started guide, that's about it. I was rather surprised -- and disappointed -- at the audio quality I got from the BackBeat Go 3. The bass seemed to be either suppressed or missing altogether, even on music numbers that were less dependent on a heavy bass background. As a result, the music felt slightly removed, even at higher volumes. Audio quality for phone calls was satisfactory but could be better -- my caller reported that my voice sounded a little tinny and distant. On my side, it was the same -- there was no struggle to understand, but there was a distinct electronic quality to it. Plantronics has produced some excellent headsets (I've favorably reviewed its Voyager 5200 and BackBeat Sense), but unfortunately, the BackBeat Go 3 doesn't quite live up to the company's rep. Although this device offers a reasonably comfortable fit and (with a boost from the optional carry case) nearly 20 hours of listening time, the audio is missing the lower tones that is necessary for serious listening. When you are using a headset for a long workday or plane flight (as opposed to an hour-long workout), battery life can be an important factor. Of the Bluetooth stereo headsets reviewed here, two offer exceptional battery life. The BackBeat Go 3 is rated for 6.5 hours on its own, while its optional carry case adds another 13, which is nothing to sneeze at. However, the audio quality of the BackBeat is pedestrian and not really up to the standards most users would expect. The Jabra Halo Smart, while not quite as packable as the BackBeat Go 3, promises up to 17 continuous hours, a boon for workaholics who spend their days listening and talking. It also offers fine audio and talk quality, and a number of interesting features that the busy professional will find very useful (although it would be nice if the company fixed the bugs in its apps). Not a bad choice at all. However, if you are a music enthusiast whose primary goal is the best sound possible in a lightweight pair of earbuds, you'll want to try the Jaybird Freedom. Although rather expensive, it has outstanding sound quality for both audio and talk, an app that lets you tweak the sound to suit your preferences, and an innovative charging clip that adds an additional four hours to the headset's existing four. As someone who is skilled at losing small devices, I can't help being a little paranoid about losing that clip, but I'd be willing to take the chance.